Following the D.O.T. certification of the Alkane Class 7 Cab Over and the introduction of the Alkane Dominator™, Alkane Truck Company makes official the development plans for the Alkane Class 8 Cab Over. The announcement to produce the LPG Powered Class 8 Cab Over makes good on our promise to fleet operators across America that we are committed to providing the trucking industry a viable alternative to diesel and gasoline. 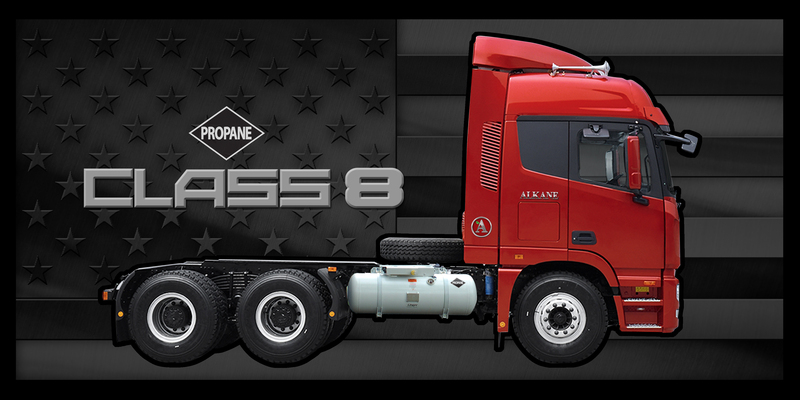 Alkane Truck Company will produce a Liquid Propane Auto-gas (LPG) powered Class 8 Cab Over for the long haul trucking industry. This announcement makes official earlier speculation that the company has been developing a Class 8 Cab Over to run on an alternative fuel. In November 2015 Alkane’s LPG Powered Class 7 Cab Over completed D.O.T. certification. The company will begin production of the Class 7 later this year. The Class 7 Cab Over is the first alternative fuel powered cab over to be introduced in this class. In December Alkane unveiled the Alkane Dominator™, a Humvee-type vehicle that will also utilize the cleaner-burning LPG. The Alkane Dominator™ is expected to complete certification and be ready for production in 2017. The Alkane Dominator™ is expected to not only appeal to off-road enthusiasts in the civilian market, but fits the needs for municipal and government applications. The Class 8 completes Alkane’s current truck development plans, and is expected to be available for dealer purchase by the end of 2018. When asked why the company chose LPG for the Class 8 truck, Alkane’s CEO, Bob Smith answered, “LPG makes the most sense because the distribution is already in place and growing annually. We’ve been able to get good torque from the LPG powered engines, and we think it’s a perfect fit for the Class 8.” The Class 8 trucks will be assembled in Alkane’s South Carolina assembly plant along with the other two preceding models. For more information visit the Alkane Truck Company main website at http://alkanetruckcompany.com and the Alkane Dominator™ site at http://alkanedominator.com.